…and an addiction was born. After several months of making that my lunch twice a week, I got the news in September that they would no longer be parking outside of Nationwide during lunch. It’s sad to say, but that kind of ruined my week. What was I going to do for lunch now? Have cafeteria food? (Ick!). Or worse yet, pack a mediocre sandwich from home? Kickin Chicken did reappear around town during those bleak months, but nothing close to work or home. All I could do was hope that one day, I would be in the area that they were in, and could have my chicken addiction once more. 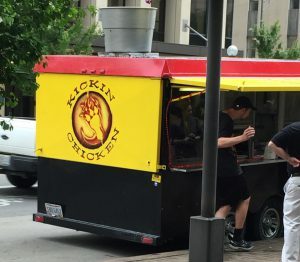 Not long ago, I received the notification on the Kickin Chicken Mobile Facebook page that they would be back downtown, outside of Nationwide, parked along High Street. Excited doesn’t even describe what I felt. I marked the day on my calendar, and right on the dot of 11, my husband and I lined up, ready to go. By 11:05, there were 20 people in line. 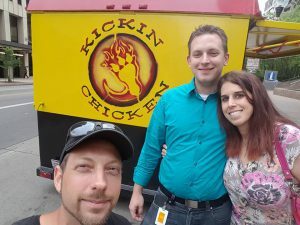 Kickin Chicken had been missed, and people were eager to have them back. We asked the owner, Michael, if they are going to be back permanently, and he informed us that they will be back at least once a week. We have been standing in line nearly every time we see his truck. The pile of wangz is just as good as I remember, the long eight months without my go-to lunch now forgotten. I recently tried the salad as well. The combination of the chicken and buffalo sauce on top of a pile of lettuce and cheese also makes for a lunch that causes my mouth to water just thinking about it. I really should try a wrap one of these weeks too, because I hear from other Kickin Chicken addicts that they are just as delicious. …or, if you’ve already tried them out, what do you think? On a five star scale, Kickin Chicken Mobile is off the charts a solid 5. Sounds like I need to try this with you sometime!